Artillery dominated military ballistics from the earliest use of gunpowder. In 1865 Jules Verne could only realistically consider a cannon for a moon launch in his influential novel. Even after the rocket established its primacy as a method of accessing space, Canadian Gerald Bull began a life-long struggle to use guns for cheap access to space. His successes could not generate funding to continue. Others since then have pursued the technology, convinced it was the only way for low-cost delivery of payloads to orbit. Artillery dominated military ballistics from the earliest use of gunpowder in guns and rockets. It was natural that Jules Verne could only realistically consider a cannon for a moon launch in his prescient 1865 novel, From the Earth to the Moon. Until the first V-2 test flights, it was guns that set the altitude and speed records for artificial objects - notably the Paris Gun of World War I. Even after the rocket established its primacy as a method of accessing space, Gerald Bull of the Canadian Armament and Research Development Establishment began a life-long struggle to use guns for cheap access to space. In the 1950's Bull pioneered the use of gun-fired models as an economical approach to study supersonic aerodynamics. The model was fitted with a wooden shell, or sabot, that matched the diameter of the gun barrel. After leaving the barrel the sabot would fall away and the model would continue, with high-speed cameras recording its behavior in flight. By 1961 Bull had expanded his concept and obtained a $10 million joint contract from the US and Canadian Defence Departments for a High Altitude Research Program (HARP). This was to prove the feasibility of using large guns for launch of scientific and military payloads on sub-orbital and orbital trajectories. For long range shots a range was established at Barbados, where the payloads could be sent eastward over the Atlantic. A surplus 125 metric ton US Navy 16 inch gun was used as the launcher. The standard 20 m barrel was extended to 36 m, and converted to a smooth-bore. In 1962 - 1967 Bull launched over 200 atmospheric probes to altitudes of up to 180 km. By this time relations between Canada and the United States were strained because of the Viet Nam war. Canada terminated the project. Bull managed to retain title to the assets of HARP, and became a consultant to artillery manufacturers and users. This included work with South Africa, supported by the American CIA. This landed him in jail in 1980 for illegal arms dealing. After release from prison he moved to Europe and continued to help the world's combatants to modify their artillery to out-range their opponents. This eventually led to a contract with Iraq to build the 'Project Babylon' supergun, designed for launch of payloads into orbit or warheads over extreme ranges. Israel did not consider this a threatening weapon, but Bull's work to assist the Iraqi's in a multistage missile using clusters of Scud rockets was another matter. After refusing to break contact with the Iraqis despite repeated warnings, Bull was assassinated in March 1990. The gun was never completed and was disassembled by the United Nations after Iraq's defeat in the Gulf War. Another approach to gun-launch was the Lawrence Livermore Laboratory SHARP Light Gas Gun. This was funded as part of the Strategic Defence Initiative as a possible anti-missile defense weapon. Efforts by its project leader to develop it into a space launcher or commercialize it came to naught. The ability of a supergun to launch low cost satellites is usually the sole attribute discussed when gun-launched satellites are compared to those orbited by conventional launchers. However the supergun's real potential is not only low cost, but also the ability to launch a vast numbers of satellites each year in all kinds of weather. Interest in superguns as weapons of war and as space launchers continues in China and Iraq. Paris Gun German gun-launched missile. The Paris Gun of World War I could hurl a 120 kg shell with 7 kg of explosive to a range of 131 km and an altitude of 40 km. Valier-Oberth Moon Gun German gun-launched orbital launch vehicle. In 1926 rocket pioneers Max Valier and Hermann Oberth, members of the VfR (Society for Space Travel), amused themselves by designing a gun that would rectify Verne's technical mistakes and be actually capable of firing a projectile to the moon. V-3 German gun-launched missile. The V-3 Hochdruckpumpe (aka HDP, 'Fleissiges Lieschen'; 'Tausend Fussler') was a supergun designed by Saar Roechling during World War II. The 140 m long cannon was capable of delivering a 140 kg shell over a 165 km range. Construction began of a bunker for the cannons in September 1943 at Mimoyecques, France. The site was damaged by Allied bombing before it could be put into operation and was finally occupied by the British at the end of August 1944. Two short-length (45 m long) V-3's were built at Antwerp and Luxembourg in support of the Ardennes offensive in December 1944. These were found to be unreliable and only a few shots were fired without known effect. Martlet 1 Canadian sounding rocket. The Martlet One Flight Vehicle was designed in mid-1962 as a first generation test vehicle for the HARP project. The primary role of the Martlet One was to test the fundamental technologies that were to be used in the Martlet Two vehicle. These included the internal ballistics of the 16" L45 smooth-bored gun system, the pusher plate/ laminated plywood sabot system and the ability to receive radio telemetry from a gun launched vehicle in flight. Martlet Canadian gun-launched orbital launch vehicle. In 1962-1967 Canada's Gerard Bull led development of the Martlet system for gun-launched access to space. The program was cancelled before the objective of gun launch to orbit was attained. Martlet 2 Canadian sounding rocket. The Martlet 2 series were the primary 16" gun-launched sub-orbital flight vehicles used during the High Altitude Research Program (HARP). Martlet 2's were used to conduct extensive research at altitudes of up to 180 km with some 200 flights being conducted between 1963 and 1967. The very low cost per flight, about $3,000, made it ideal for a wide variety of applications. 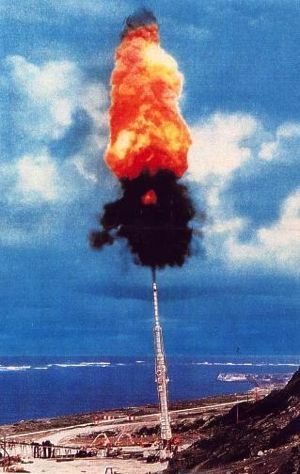 Typical mission payloads included chemical ejection to produce an observable atmospheric trail and assorted sensors with multi-channel telemetry. Martlet 3 Canadian sounding rocket. Single stage, gun-launched vehicle. Martlet 3A Canadian sounding rocket. The Martlet 3A was the first serious attempt to produce a sub-caliber, gun-launched, rocket-assisted, vehicle for the 16 inch gun system. The basic design criteria for the Martlet 3A was to gun launch a vehicle containing a rocket motor that could provide a velocity boost equal to or greater then the initial gun-launch velocity. The theoretical performance of the Martlet 3A was for an 18 kg payload to be carried to an altitude of some 500 km at gun-launch accelerations of 12-14,000 g's and gun launch velocities in the range of 2100 m/sec (similar to the Martlet 2 series maximum launch parameters). Martlet 3B Canadian sounding rocket. Once the fundamental design flaws of the Martlet 3A vehicle were identified the system was redesigned and a new vehicle, the Martlet 3B, was created. The Martlet 3B vehicle was similar in design to the 3A vehicle but sported several design changes intended to improve the system performance. The first major change was to replace the aluminum airframe with a alloy steel airframe in the hopes the stronger material would lead to higher mass fractions. Other improvements included the use of a larger diameter rocket motor (increasing the outer diameter to 8 inches / 20 cm) and the use of six fixed fins instead of the 3A's four fins. 5 inch HARP Gun Canadian gun-launched sounding rocket. When most people think of the HARP Program they usually think of the big 16 inch guns roaring skywards as they launch test probes into the upper atmosphere. What most people do not realize was that even before HARP small portable gun launchers were used for the same purpose and even during HARP hundreds of high altitude flights were conducted using small guns. The 5 inch gun-launch system was initially designed to satisfy the requirements of the Meteorological Rocket Network This required that an 0.9 kg (2 lb) payload be carried to an altitude of 65 km (40 miles). Typical payloads were radar reflective chaff ejected at apogee, which was tracked by radar to yield wind data, and small Metsondes which drifted to earth under large parachutes and returned radio telemetry of temperature, humidity and the like. Martlet 4 Canadian gun-launched orbital launch vehicle. The Martlet 4 was ultimate goal of the HARP program - a gun-launched orbital launch vehicle. Two versions were considered: a preliminary version with two solid propellant upper stages, and a later model with two liquid propellant upper stages. Payload of the liquid propellant version would have reached 90 kg. The initial version was in an advanced stage of suborbital flight test when the HARP program was cancelled in 1967. GLO-1B Canadian gun-launched orbital launch vehicle. When compared to the early Martlet 4 designs the GLO-1B was a considerably more sophisticated vehicle with many of the shortcomings of it's predecessor having been addressed. Not long after the original HARP project ended the major assets of the project were acquired by the projects management, Dr. Gerald Bull in particular. The HARP Program became the Space Research Corporation (SRC) with the intention of resurrecting the HARP orbital program. Over the years a much improved and considerably more sophisticated Martlet 4 was developed and given the name of GLO-1B. Martlet 2G-1 Canadian gun-launched orbital launch vehicle. The Martlet 2G-1 was the absolute minimum gun-launched satellite vehicle. Conceived when the HARP project was under threat, it was a seven-inch diameter, two-stage solid propellant vehicle that would be sabot-launched from the HARP 16 inch gun. Its total payload in orbit would have been just two kilograms - ideal for today's planned nano-satellites. Unfortunately even this minimum orbital launch vehicle could not be demonstrated before the program was shut down. Martlet 2G Canadian sounding rocket. This derivative of the Martlet 2 gun-fired suborbital space probe achieved a higher scientific payload through use of a lighter sabot. 12 were flown before the program was ended. 7 inch HARP Gun Canadian gun-launched sounding rocket. The highly successful 5 inch HARP gun had demonstrated the immense versatility of small portable gun systems for atmospheric exploration. The 7 inch HARP gun system represented the 5 inch system scaled up to the largest barrel size practical, while still remaining portable. HARP 5-1 Canadian earth atmosphere probe. Launched from 1960. The HARP 5-1 gun probe was a dart-shaped, sub-caliber vehicle with a major diameter of 66 mm, a length of 116 cm and a flight weight of 10.4 kg. HARP 5-3 Canadian earth atmosphere satellite. Study 1960. The HARP 5-3 probe was developed during HARP to reduce the complexity of the 5 inch vehicles and in particular the nose eject system used by the HARP 5-1 probe. HARP 7-1 Canadian earth atmosphere suborbital probe. Flights from 1961. The original HARP 7-1 gun probe was fundamentally a scaled up version of the 5-1 gun probe and was used for similar payloads. HARP 7-2 Canadian earth atmosphere probe. Study 1961. The Harp 7-2 vehicle was an optimized version of the 7-1 vehicle. The 7-2 had a body diameter of 76 mm a length of 1410 mm a flight weight of 18.2 kg and a payload volume of 2048 cc. SHARP American gun-launched test vehicle. The SHARP (Super High Altitude Research Project) light gas gun was developed by Lawrence Livermore Laboratory in California. The L-shaped gun consisted of the 82 m long, 36 cm caliber pump tube and the 47 m long, 10 cm caliber gun barrel. SHARP began operation in December 1992 and demonstrated velocities of 3 km/sec with 5 kg projectiles. However the $ 1 billion funding to elevate the tube and begin space launch tests of smaller projectiles at speeds of up to 7 km/sec was not forthcoming. By 1996 the gun was relegated to occasional test of sub-scale Mach 9 scramjet models. Babylon Gun From March of 1988 until the invasion of Kuwait in 1990, Iraq contracted with Gerard Bull to build three superguns: two full sized 'Project Babylon' 1000 mm guns and one 'Baby Babylon' 350 mm prototype. Nine metric tons of special supergun propellant could fire a 600 kg projectile over a range of 1,000 kilometers, or a 2,000 kg rocket-assisted projectile. The 2,000 kg projectile would place a net payload of about 200 kg into orbit at a cost of $ 600 per kg. The 1000 mm guns were never completed. After the war UN teams destroyed the guns and gun components in Iraqi possession. Chinese Supergun In January 1995 the Chinese army unveiled a 21 m long supergun capable of firing large artillery shells into South Korea and Taiwan. The gun could fire 85 mm shells over a 300 km range. Nothing further was heard of the weapon. Interestingly, China was one of the countries that retained Gerard Bull as a consultant in artillery design in the 1980's. It would seem that the supergun retained its military appeal as a psychological weapon or in anti-satellite applications. Jules Verne Launcher American gun-launched orbital launch vehicle. Following the failure of the US government to fund further development of the SHARP light gas gun, John Hunter founded the Jules Verne Launcher Company in 1996 in an attempt to fund commercial development of the concept. Martlet 3D Canadian sounding rocket. The Martlet 3D concept was intended to serve as a sub-orbital vehicle capable of lifting heavy payloads to satellite altitudes. The Martlet 3D was simply the first stage of the Martlet 4 vehicle ( Martlet 4A) with the two upper stages and the satellite payload being replaced with a single large payload. Martlet 3E Canadian sounding rocket. The Martlet 3E vehicle was designed to take advantage of the portability of the HARP 7 inch guns. Unlike the big fixed 16 inch guns the 7 inch HARP guns, were portable and could be relocated to conduct launches from a wide variety of sites. It was soon determined that a gun-launched rocket vehicle for the 7 inch gun would have a similar performance to the Martlet 2 glide probe launched from the fixed 16 inch guns. Launch costs would also be about the same. Industrial Sounding System Canadian gun-launched sounding rocket. Columbiad Launch Services announced itself publicly in August 2003. They were then developing a high-volume Industrial Sounding System based on gun propulsion technology, which was scheduled to be fully operational by late 2004. This would also serve as a prototype for a follow-on orbital gun-based launch system.